OLYMPIA – Washington law requires the State Patrol to provide security for a governor even when he’s out of state campaigning for president, Gov. Jay Inslee said Monday. Inslee, who leaves Tuesday on a week out of state during which he is primarily on the presidential campaign trail, defended the extra $3.4 million proposed for the upcoming state operating budget to cover the increased personnel for his security detail. During the Senate debate over the general operating budget last Thursday, Republicans tried to redirect that $3.4 million with an amendment that would have removed that amount from the State Patrol budget and spent it on breast, cervical and colon cancer screenings. “He should not expect the hardworking taxpayers to shoulder the cost of additional security,” said Sen. Sharon Brown, R-Kennewick, who proposed the amendment. When President Trump attends political events, taxpayers pay for the security, countered Sen. David Frockt, D-Seattle. It’s rare when a politician from Washington rises to the level of prominence to run for president, he added. Sen. Shelly Short, R-Addy, accused Darneille of “impugning” Brown. Because the State Patrol has that legal responsibility, the agency will provide the security even if the Legislature doesn’t approve the extra money, Senate Ways and Means Chairman Christine Rolfes, D-Bainbridge Island, said. 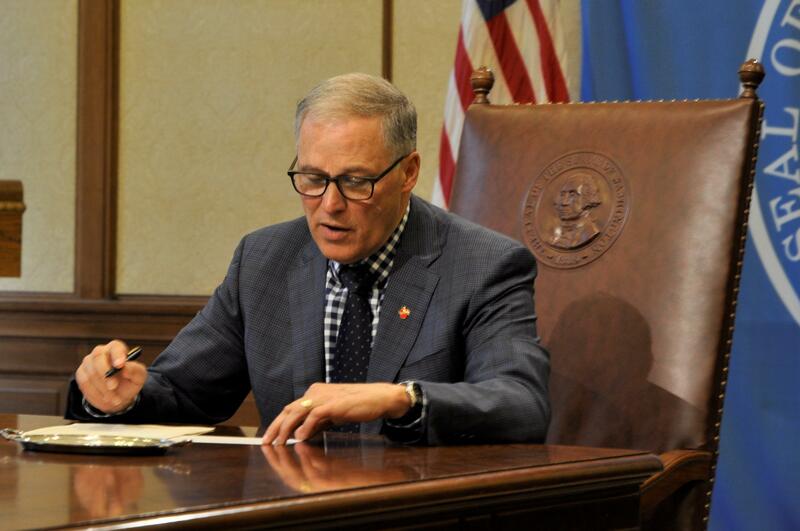 Inslee will be out of the state for seven days beginning Tuesday, with one official duty as governor, attending a global energy summit at Columbia University. The rest of the time he’ll be campaigning, with a televised town hall meeting on CNN at 7 p.m. Pacific time Wednesday and appearances on CBS and MSNBC Thursday. Over the weekend he will be in Iowa, which holds the first presidential precinct caucuses, and New Hampshire, which holds the first presidential primary. On Monday he’ll be in South Carolina, which holds the second presidential primary, for another town hall meeting. Published: April 8, 2019, 6:30 p.m. Updated: April 9, 2019, 4:33 p.m.